Powers/Abilities: Wilhelm Schultz possesses the normal human strength level of a man of his age, weight and build who engages in extensive regular exercises. He has no superhuman powers, but he is a seasoned and experienced military commander trained in the arts of warfare and military munitions including unarmed combat with great ferocity. He is quite adept with a knife. History: (Silver Sable#9 (fb)) - Wilhelm Schultz was a Nazi military commander during World War Two, but under unresolved circumstances, he avoided being captured for his crimes against humanity by the Allied Forces. Eventually, he made contact with the National Front, a splinter group of the Ku Klux Klan funded by Spanish bank robbers in order to smuggle himself into the United States. 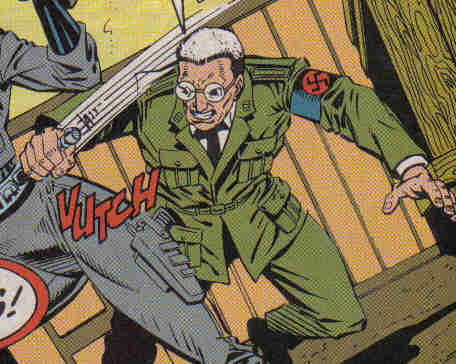 His flight from justice, however, was hampered by Ernst Sablinovia (father of Silver Sable) and the Wild Pack, a team of Symkarian soldiers specifically trained for pursuing escaped war criminals. Schultz was linked to the National Front and cornered while in their presence by the Wild Pack. Schultz was briefly underestimated as an old man by Silver Sable in the early stages of her training and he very nearly got the upper hand on her, but she followed out her father's orders and killed Schultz by impaling him through the back. 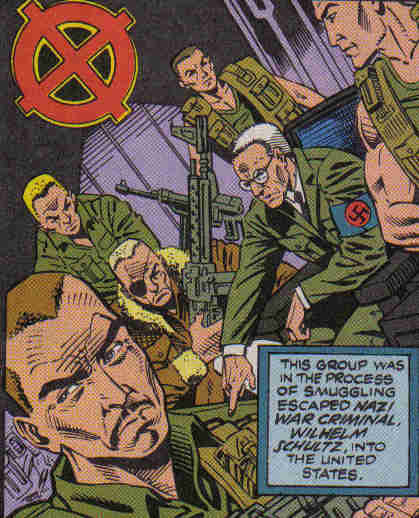 Wilhelm Schultz has to be among the most obscure figures of the Marvel Universe. His entire appearance occurs entirely in flashback. The National Front was a splinter group of the Ku Klux Klan funded by Spanish bank robbers and hired by Wilhelm Schultz to help him in his unlawful flight into the United States. This venture was prevented by Ernst Sablinovia and Wild Pack. All other characters mentioned or pictured are � and � 1941-2099 Marvel Characters, Inc. All Rights Reserved. If you like this stuff, you should check out the real thing!